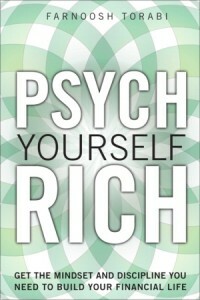 This week I’m reviewing Psych Yourself Rich. I was excited to receive a review copy to share my thoughts on the new book. If you’re not familiar with her, Torabi is the author of You’re So Money: Live Rich Even When You’re Not. She’s a;so contributed to The Today Show, Good Morning America, and Money magazine. Not sure if her new book is for you? Hopefully my review will help you make the decision. Torabi has organized her book on 3 principles clearly. Each has it’s own focus while maintaining her confident and encouraging style to help readers along as they improve their finances. There are a lot of people who want to be rich, but can’t really define what it means to them. Torabi spend a few chapters looking at the traits that people associate with those that are wealthy and then asks readers to decide what they want. Do they want to be big earners and spenders or do they want to be earners and givers? It examines how to identify opportunities to improve your finances and introduces accountability into the equation. She finishes the section with some common emotions that people associate with money and how to work with them. After your own values and goals are define, the next section looks at removing the clutter and designing a system that works for you. Online and offline tools were mentioned and reviewed to help readers decide what could work for them personally. She also looks at being your own advocate and being assertive on getting better deals. The final part of the book is dedicated to seeking more entrepreneurial options. By nature, people are risk adverse. It makes sense many times as you want to protect your investments or your career. However, it can be beneficial to break out and look at more profitable options. From these big ideas, she drills down and tackles them one by one. What’s Inside Psych Yourself Rich? There is a lot of information inside the book. Depending on where you are at financially, you can read it cover to cover or you can jump around to what interests you. Here are the topics covered in the book. Personalize Rich – Torabi open up with her first thoughts of being rich and what it meant to her. She also spoke with experts to see if there are any shifts in attitudes and ideas within wealthy Americans. I’m going to tell you what they are, you’ll have to read the book to find out! Establish Goals – Did you know 1/3 of lotto winners file for bankruptcy within 5 years? Money doesn’t substitute goals. Not having goals can lead to you losing money. Nice chapter on how to set some realistic ones up. Craft Your Money Philosophy – What are your own beliefs about money? How do you think it should be used? Great questions considered in the chapter. Embrace Your Relationship with Money -Healthy or not, everyone has some relationship to money. Many times we’ve picked it up from our family. The question is, do you want to improve it? Organize. Don’t Agonize – How many times have you said you’ll save more, but failed to do so months(even years) later? I bet you lack of organization played a part in that. Be Your Biggest Advocate – Nobody care about your finances like you do. Taking charge and be assertive can help you handle your finances. Make Your Money Count – Learn about handling risk and evaluate your spending in this chapter so you can optimize your finances. Think Five Years Ahead – Are you prepared for upcoming milestones? Are you prepared for the unexpected? If you lost your job, could you survive until you find the next one? This is a great chapter to look over as you set up your financial plans. Break from the Norm – If you’re looking at all your investment options, you should check out this chapter to get an idea of what’s out there. Embrace the Entrepreneurial Spirit – Besides starting a business, having the e-spirit can allow you to expand your role within your company. It’s about being proactive and taking the initiative. I think this book is a good fit for people who have a general idea of what they have to do, but need help developing a plan of action. It is a book that you can read and reflect on as you decide what your financial goals are in life. I’d love to hear feedback from others that have read the book. What did you think about it? What chapter was most helpful for you? What was the least helpful? If you have any questions, you can find @Farnoosh on Twitter.